Spray Tan Training course with Sunjunkie - Fully certified and accredited spray tan training courses available for beginner, intermediate and advanced levels. Learn to spray tan the professional’s way with a 1-2-1 spray tanning course at the Sunjunkie headquarters. Industry recognised spray tanning training course by the beauty industry’s leading spray tanning experts. 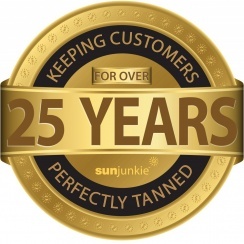 Whether you are a beginner/student looking to start your own spray tanning business or already a seasoned professional, the Sunjunkie spray tan training course will teach you the industry leading spray tan techniques. The Sunjunkie spray tanning training course will teach you the science behind spray tanning, the techniques used by our professionals at the New York Fashion Week, professional marketing and client aftercare. Our spray tan training courses have helped clients all over the world start successful spray tanning businesses from nothing, progressing on to spray tanning at some of the worlds most prestigious events such as the XFactor and Paris fashion week. We are committed to establishing a long, committed relationship with every graduate from our spray tan courses.